The British Gazette » Battleships? What battleships? At just after 1:00PM on Radio Four, the Brainless Broadcasting Coterie’s female reporter, commenting upon the today’s commemoration of VE Day declared that as well as the ring of church bells the Royal Navy’s battleships fired their guns. 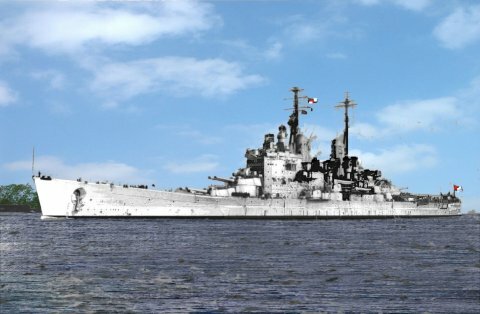 The Royal Navy’s last battleship HMS Vanguard (Pennant number 23). Vanguard was commissioned on 12th May 1946 and was decommissioned on 7th June 1960. Her “claim to fame” was to serve as the world’s largest and most heavily armed a royal yacht for the royal tour of South Africa. Great. Any criticism of BBC is great with me.